South Asian Travel Awards (SATA) has signed up with three key partners from the Maldives, ahead of the gala retreat in India. 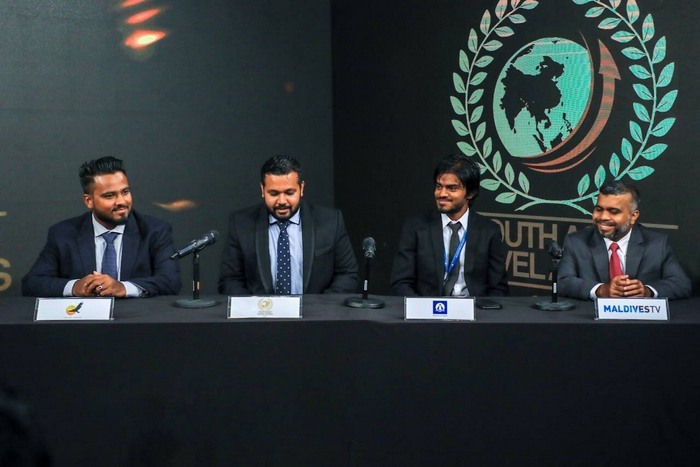 At a ceremony held in Maldives capital Male Thursday afternoon, The Hawks Pvt Ltd and Allied Insurance Company of the Maldives were announced as Gold Partners, while Maldives TV from Public Service Media (PSM) was assigned as a Media Partner. After the signing, Hussain Aman, the General Manager of The Hawks Pvt Ltd, highlighted the benefits his company has gained in partnering with SATA. “SATA team has created a platform to have one-on-one meetings with potential clients. We are proud to partner with SATA for the second year,” he told journalists. Allied Insurance’s Marketing Manager Niushad Shareef stressed the importance of travel insurance for all travellers and encouraged the hospitality and tourism industry to reap the benefits of travel insurance. He also thanked SATA for giving the opportunity to promote Allied’s travel products to a wider audience. Deputy Managing Director of PSM Mohamed Ikram explained the progress of Maldives TV, especially the international coverage and platform that have been created for the tourism and hospitality industry. PSM will ensure the best coverage is given to promote and market SATA both locally and internationally, he said. SATA has earlier signed up with UAG Marketing of Sri Lanka and Asian Geographic as Silver Partners. Mookai Hotel from Maldives, Ramada Colombo from Sri Lanka, The Chancery Pavilion and Udman Hotels & Resorts by Ferns N Petals from India, Hotel Mulberry from Nepal, and Zhiwa Ling Heritage from Bhutan serve as Hospitality Partners of SATA 2018. Travel World Online, Tourism Mail, Yambhu times, Maldives Insider, The Island Chief, MV Hotels Online, Floating Asia and Maldives TV have been appointed as Media Partners. 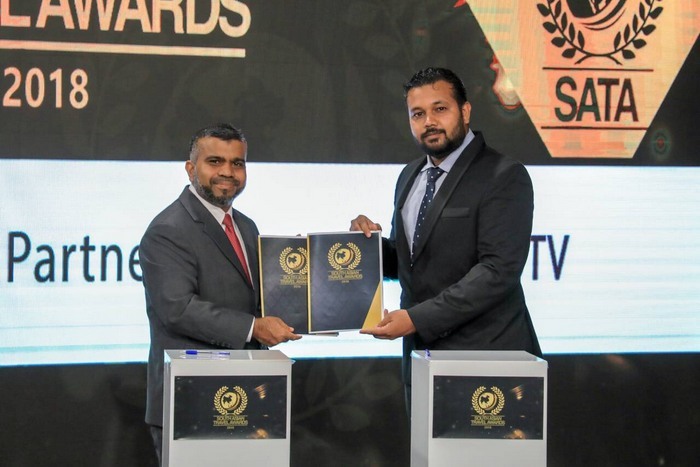 Nominations for the third edition of SATA, which consists of 36 categories in 10 segments, closed in April with a record 500 plus nominations from the Maldives, Sri Lanka, India, Nepal and Bhutan. 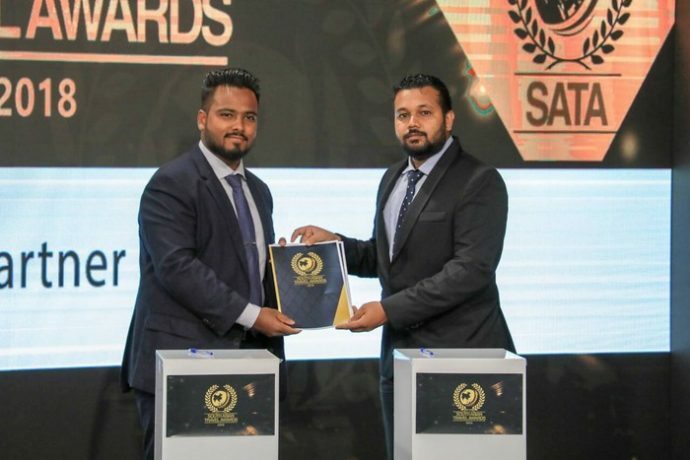 Jumeirah, Soneva, Sun Siyam Resorts, Coco Collection, Villa Hotels, The Kingsbury, Amaya Hotels and Resorts, Adaaran Resorts Maldives, Heritance Hotels, Jetwing Hotels, Cinnamon Hotels and Resorts, Marriott and Taj Hotels are some of the well-known brands that have been nominated for the awards. Online voting was carried out via the official website till June 30. SATA 2018 gala is scheduled to take place in India’s commercial capital Mumbai from September 14-15. Launched in 2016 by Maldives based event management company Highrise, SATA has been endorsed by regional tourism authorities and organisations, including the Federation of Chambers of Commerce and Industry in Sri Lanka (FCCISL), Colombo Chamber of Commerce (CCC), Maldives Marketing and Public Relations Corporation (MMPRC), Maldives Association of Travel Agents and Tour Operators (MATATO), Confederation of Associated Tour Operators (India), Association of Travel Agents (ATA) Maldives, Association of Travel and Tour Operators India (ATTOI), Association of Professionals in Tourism (APT, India), Kerala Hotel General Managers Club (KHGMC), Nepal Tourism Board (NTB) and Liveaboard Association of Maldives (LAM). SATA is the first ever regional travel awards endorsed by multi national associations, providing the tourism sector of the South Asian region with recognition towards their facilities and service excellence. It aims to encourage and raise service standards in the region’s tourism industry. The awards’ first edition, which wrapped up with a gala ceremony at the iconic Mount Lavinia Hotel in Sri Lanka, saw an overwhelming support with more than 260 nominations. Major travel media organisations, including Maldives Insider, Asian Traveller, Asian Geographic, Asian Diver and Floating Asia were appointed as media partners of SATA 2016. More than 414 nominations from the Maldives, India, Sri Lanka, Bhutan and Nepal were received for the 39 categories included in the 2017 edition of SATA, which took place at the southernmost Maldives atoll of Addu in October.